Runoff that flows down the land slopes in broadly distributed sheets is called overland flow. This is different from streamflow, in which the water runs along a narrow channel between banks. Overland flow can take several forms. Where the soil or rock surface is smooth, the flow may be a continuous thin film, called sheet flow. If the ground is rough or pitted, overland flow may be made up of a series of tiny rivulets connecting one water-filled hollow with another. On a grass-covered slope, overland flow is divided into countless tiny threads of water, passing around the stems. Even in a heavy and prolonged rain, you might not notice overland flow in progress on a sloping lawn. On heavily forested slopes, overland flow may be entirely concealed beneath a thick mat of decaying leaves. Overland flow eventually creates streamflow. We can define a stream as a long, narrow body of water flowing through a channel and moving to lower levels under the force of gravity. The stream channel is a narrow trough, shaped by the forces of flowing water. A channel may be so narrow that you can easily jump across it, or, in the case of the Mississippi River, it may be as wide as 1.5 km (about 1 mi) or more. The water meets resistance as it flows because of friction with the channel walls. So, water close to the bed and banks moves more slowly than water in the central part of the flow (Figure 14.19). If the channel is straight and symmetrical, the line of maximum velocity is located in midstream. If the stream curves, the maximum velocity shifts toward the bank on the outside of the curve. In all but the most sluggish streams, the movement of water is affected by turbulence. If we could follow a particular water molecule, we’d see it travel a highly irregular, corkscrew path as it is swept downstream. But if we measure the water velocity at a certain fixed point for several minutes, we’ll see that the average motion is in a downstream direction. The rate of water flow in a stream is called its discharge, which is measured in cubic meters (cubic feet) per second. 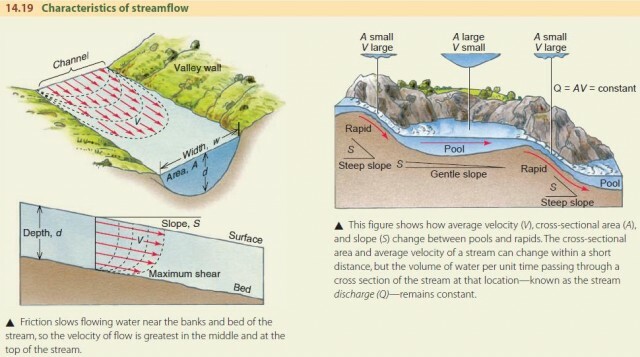 Discharge is determined by the product of the stream’s cross section and the mean velocity of the water (Figure 14.19). When the gradient, or slope, of the stream channel is steep, the force of gravity will act more strongly so the water will flow faster. When the slope is gentler, the flow will be slower. In stretches of rapids, where the stream flows swiftly, the stream channel will be shallow and narrow. In pools, where the stream flows more slowly, the stream channel will be wider and deeper to maintain the same discharge. Sequences of pools and rapids can be found along streams of all sizes. 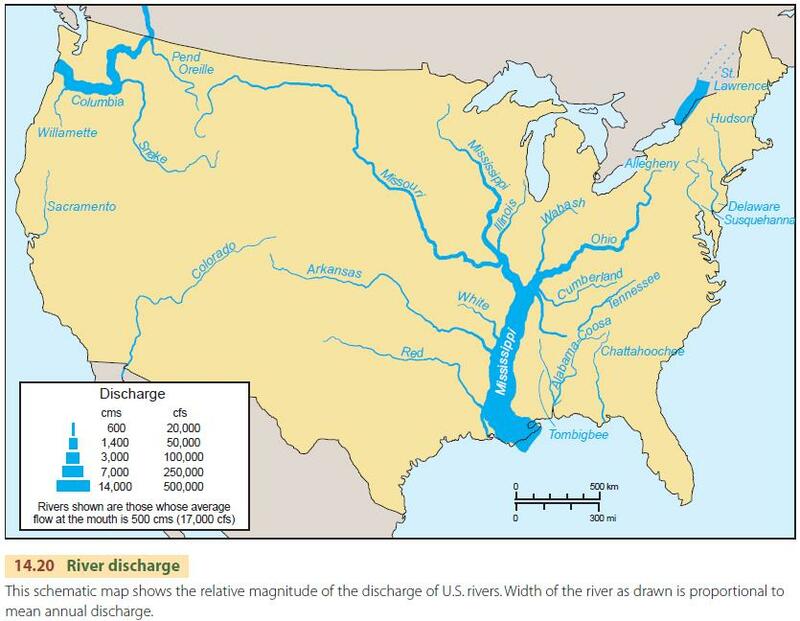 Figure 14.20 shows the relative discharge of major rivers of the United States. The mighty Mississippi with its tributaries dwarfs all other North American rivers. The Columbia River, draining a large segment of the Rocky Mountains in southwestern Canada and the northwestern United States, and the Great Lakes, discharging through the St. Lawrence River, also have large discharges. The discharge of major rivers increases downstream. That’s a natural consequence of the way streams and rivers combine to deliver runoff and sediment to the oceans. The general rule is the larger the cross-sectional area of the stream, the lower the gradient. Great rivers, such as the Mississippi and Amazon, have gradients so low that they can be described as “flat.” For example, the water s urface of the lower Mississippi River falls in e levation about 3 cm for each kilometer of downstream distance (1.9 in. per mi). As runoff moves to lower and lower levels and eventually to the sea, it becomes organized into a branched network of stream channels. 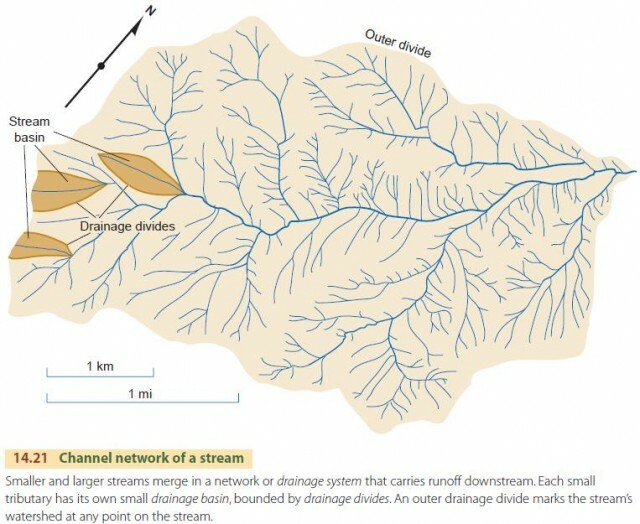 This network and the sloping ground surfaces next to the channels that contribute overland flow to the streams are together called a drainage system. The drainage divides mark the boundary between slopes that contribute water to different streams or drainage systems. The entire system is bounded by an outer drainage divide that outlines a more-or-less pearshaped drainage basin or watershed (Figure 14.21). Drainage systems funnel overland flow into streams and smaller streams into larger ones.